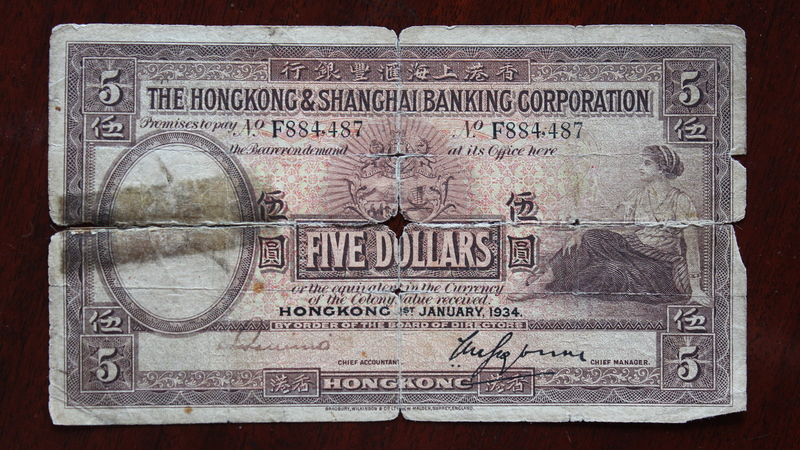 Five dollars in Hongkong & Shanghai Bank currency, issued January 1934. Too bad we can’t take Shanghai dollars. At least not like the fiver you see here, which came out of Virginia’s scrapbook. Before that, I’m sure, out of her mattress. Shanghai in the 1930s was safe enough for the Brits in the International Settlement, but you still had to keep a reserve of cash under the covers. So it’s so nice to roll over and wake up to new Kickstarter pledges! I get these little push notifications on my phone: “New Backer Alert!” Very nice. A week into our Kickstarter drive and we’re nearing 20% of our funding goal of $20,000. Not bad for our grassroots campaign, but we need to kick it up a notch to hit the mark by June 1. Too bad we can’t take checks, either. Of course, we’re happy to accept legitimate donations of any kind for the film, but only credit cards count towards our goal. If you want to make a donation but are unable to use a computer, or if you’re having any sort of trouble completing the donation process, please email me at phwells @ me.com. Of course, I’d much rather you talk to all your friends, relatives, associates and social media connections about pledging contributions for My Shanghai on Kickstarter. Just ask them to click the big green button to “Back This Project” and follow the prompts. We have 22 days to go. We love this project. You love this project. The funds are out there, not stuffed in mattresses, but in the hands of people who can help it come alive.